It’s pretty common to hear synth buffs talk about how we’re living in a Renaissance period of synthesizers. And there’s certainly a case to be made, what with all of the dirt cheap analog synths that Korg is currently producing, a thriving Eurorack scene making modular synthesis more accessible than ever, and opulent new polysynths coming from Dave Smith Instruments and Waldorf. The current era — typified by designs boasting analog circuitry, knob–heavy interfaces, or both — likely kicked off in the mid–’00s with Moog launching the Little Phatty and Dave Smith Instruments rising by way of the Evolver and Mopho. But it’s not like we were living in the dark ages before those synths were in production. In fact, the strides made in digital synthesis were just as accessible to the masses as Korg’s rebooted ARP Odyssey is today. The ‘90s and ‘00s saw just about every company in the game developing its own proprietary form of synthesis and putting it into as many packages and price points as possible. Indeed, some of the best synth deals of today — according to sheer sound quality and power–per–dollar spent — are available to the intrepid who can live without knobs and keys. The tabletop and rackmount synths from the ‘90s and ‘00s had exceptionally engineered sound engines, making for a trove of old studio equipment unmined by today’s home recording culture. These synths tend to be total sleepers, thanks in part to unsexy naming schemas including combos of letters and numbers and to the fact that no one is nostalgic for esoteric digital sounds yet. With that said, not everything on this list is digital, and a couple entries mark some of the best analog circuits ever produced. So if you’ve bought your Korg Monologue and feel like you don’t need another fat analog monosynth with a great sequencer for the rest of your life, consider some dirt cheap, high–quality rack and tabletop synths. While the lack of keyboard undoubtedly keeps the price down on these hidden gems, they’ll work fine with a MIDI controller and even better when run off of Ableton Live over MIDI. A great example of a mass–produced synth that really pushes it to the limit, the FS1R is the first FM synth that Yamaha built after taking a few years off from milking that cash cow. Yamaha knew it was effectively competing with its own DX7 that it produced in massive numbers, so the company stepped its game up with this 1998 synth by including its own Formant Shaping Synthesis. Typically, formant synthesis is used to emulate the vowel sounds in human speech. And sure, you can do that with the FS1R, but the bigger appeal is that you can combine the FSS and FM synthesis techniques to make some truly out there sounds. This is Yamaha delivering on the promise that digital’s natural value is that it can really sound like nothing else. In the days before computers took over, Roland saw a market demand for a synthesizer that would become the center of any beatmaker or dance music producer’s workflow. 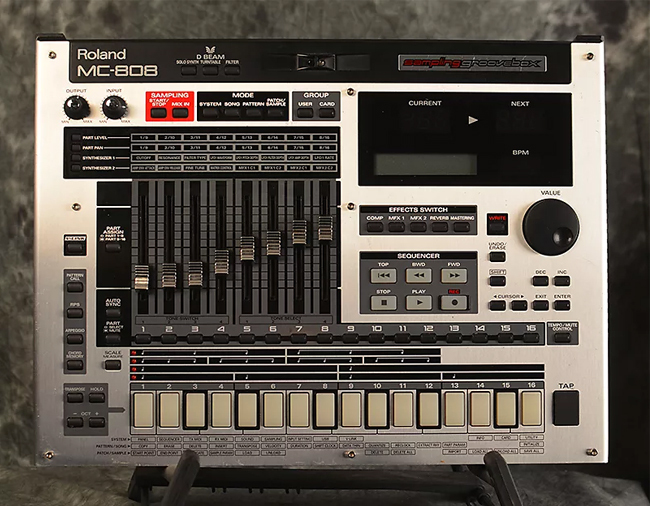 This led to the MC series of grooveboxes (the synth counterpart of the SP series of samplers), and the MC–808 was the biggest and baddest one ever made, first introduced in 2006. The MC–808 is effectively a wavetable synth with a step sequencer, souped up to the nth degree. It contains a series of percussion sounds, subtractive–style digital synthesis, sampling functionality, an arpeggiator, a song mode, and, well, a lot more. It’s a powerful and fun synth that basically has all of the power of Ableton Live for a running price of $300 to $500 used. Oberheim’s OB series would produce some of the most iconic synth tones of the ‘80s. But by the end of the decade, the company was facing the same ails as Sequential Circuits and Moog, with digital synths getting better and better at the acoustic emulations that the music industry so craved. The Matrix 1000 was one of the company’s final designs, and an effort to create a true studio synth. The guts include two analog DCOs per each of the 6 voices, a great filter, and ramp generators (that’s on top of the more conventionally used envelope generators). The Matrix 1000 sounds incredible and tends to sell for around $600, but its minimal interface does make it a drag to program. You can buy Access's Matrix Editor to do that work, though. Founded by Stevie Wonder and public intellectual and futurist Raymond Kurzweil, the Kurzweil Musical Systems company has often been an outlet for next–generation performance keyboards. Often, this has translated to really good emulations of grand pianos — both in terms of feel and sound — but it also meant an audacious run of synths back in the ‘90s. Those efforts would culminate with the K2600, but the K2500 is the purest distillation of the company’s vision for synths. It features the proprietary VAST synthesis that does everything from acoustic modelling to analog–style subtractive synthesis to totally bonkers digital sounds well. It also features microtuning, which pretty rare for any synth, period the end. The K2500R is obviously the rackmount version of the K2500, and the K2500RS has a sampler built in, stepping on the Ensoniq EPS–16+’s toes and totally ruining its shoes. The K2500 originally listed for around $20,000, but the rack versions now run for a few hundred. This is literally one of the best analog synths Roland ever made. The only reason it hasn’t been swept up in the vintage rolling craze is likely that it doesn’t have the keys or the control interface of the Juno and Jupiter series synths. The MKS70 is is the rackmount version of the JX10, and the last analog Roland produced as part of that analog run that started with the Jupiters back in the early ‘70s. It was released in 1986 around the time of the other JX models, and like the JX10 and the JX3P, it can be programmed with an external PG–800 controller. Sure, a rackmount analog (especially without the external programmer) isn’t as fun to program as a keyboard analog with all those knobs and sliders, but if you want top notch analog sounds to run off your sequences in your DAW, you can grab these pretty consistently in the mid– to high–hundreds price range. During the ‘70s, the only type of “synthesizer” really available to the masses was the string synth, which was effectively an electric organ using an array of sawtooth waves to approximate the buzzy timbres of orchestral strings. Polysynths being made accessible to working musicians was really an ‘80s phenomenon. But because string synths appeared on so many recordings — especially disco cuts — they became part of the popular synth lexicon. Hence, it makes a lot of sense that Roland would seek to create the most hi–fi string synth ever wrought, with its M–SE1. As part of Roland’s Sound Expander series (which includes plenty of great rackmount synths that do more typically synth sounds, all of which run for just over $100 now), the M–SE1 is such a faithful string synth that it actually sounds like the strings it emulates. This works great as a pad generator for your ambient music or for some haunting Twin Peaks jams. Following up one of the most expensive and least obtainable synths with a baffling amount of power in existence is one of the least expensive and most obtainable synths with a baffling amount of power in existence. The Kawai K1M is a beautiful synth whose low bitrate makes for a digital synth with warm, gritty sound that scratches the same itch for many as analog circuitry. Developed somewhat in the vain of Roland’s D–50, Kawai’s lifelong mission of bringing synths to the working musician resulted in this tabletop synth that’s both simple to use and vast in its functionality. It lacks a filter and effects, but the ability to layer waveforms give you all the sound you’ll really need out of a high–quality polysynth that rarely sells for more than $200. 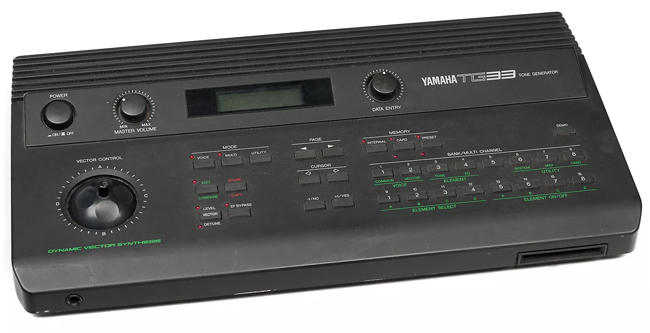 While we’re talking about total tabletop steals, the TG33 is another exquisite digital synth from the ‘90s that often sells in the low– to mid–hundreds on the used market. 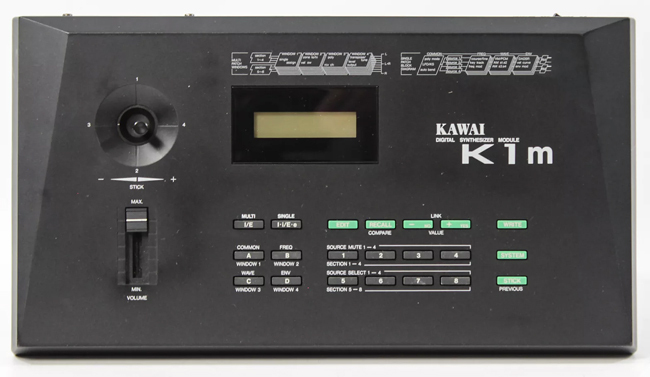 This uses a pretty similar wave sampling technique as the Kawai K1M, but also employs Yamaha’s signature FM synthesis. Like any of Yamaha’s other FM options, it’s not all that easy to program using the button interface that comes native to the machine, but it has a joystick that makes transforming the preset tones a snap. If you’re thinking about buying Korg’s Volca FM, consider saving your pennies for Yamaha FM perfected, featuring 32 voices of polyphony over the Volca’s 3.